When you are looking for copackers you can trust to deliver top-quality products to your end-users, you need a company with experience, industry knowledge, and a commitment to food safety and quality. Enter Tropical Bottling Company. 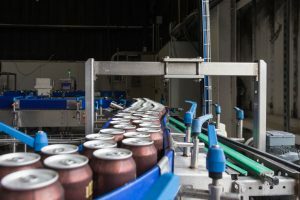 We are the perfect copackers for tea, energy drink, flavored coffee, and soft drink manufacturers, as well as those who bring a wide range of other ready-to-drink (RTD) products to market. At Tropical Bottling Company, we adhere to GMP (Good Manufacturing Practice) standards and are both HACCP and SQF Level II Certified – which showcases that we are copackers who are dedicated to the highest quality control and safety standards. You can rely on us to keep the safety and quality of your RTD beverage top of mind throughout the production process. Learn more about our facility or our certifications now! In addition to safety and quality, we are the copackers to turn to for comprehensive processing and packaging capabilities. We offer a broad assortment of can sizes, ranging from 7.4 oz. to 16 oz., and offer regular, sleek, and specialty cans. We can provide cold fill or hot or cold fill pasteurization and are proud to offer multiple mixing technologies, reverse osmosis water treatment, fructose and liquid or granulated sugar sweeteners, HTST (Hot Temp / Short Time) canning, and more. And, when you choose to partner with Tropical Bottling Company, you can enjoy more labeling and packaging options than you would by partnering with most other North American copackers. We can accommodate either in-house or 3rd party labeling preferences, provide you with custom palletizing, warehouse your finished goods, and offer an assortment of other value-added services you won’t find anywhere else. For answers to some of our most frequently asked questions, please view our FAQ page today! As one of the most preferred copackers serving the US, we have helped hundreds of flavored coffee, tea, juice, energy drink, and soft drink manufacturers from Florida, Georgia, Alabama, Mississippi, Louisiana, and other US states expertly copack their products. We are the copackers to rely on for nearly any RTD product. Contact us today to learn more!